I am on this kick of going into the bulk section of the grocery store and buying alternative grains. I guess I am feeling left out since I don’t have a gluten allergy. It seems like I am the only one on the planet that still eats gluten, and that can start to go to your head, you know? But I feel justified when I can still go to a bakery a order a pain au chocolat. I picked up some bulgur the other day, as well as some red lentils. Mostly I bought the lentils because they are pink, and you can’t buy very many things that are naturally pink. And the bulgur? Well the name, you really should try things like a name like bulgur. Heat oil in a skillet over medium heat. Add onions and cook until they start to sweat. Add zucchini and cook until tender, about 8 minutes. Add the onion mixture to bulgur-lentil mixture. Stir in basil, chives, lemon zest, butter, salt and pepper to taste and toss to incorporate. This entry was tagged Bulgur, food, Gluten Free, Lentils, madey edlin, photography. Bookmark the permalink. 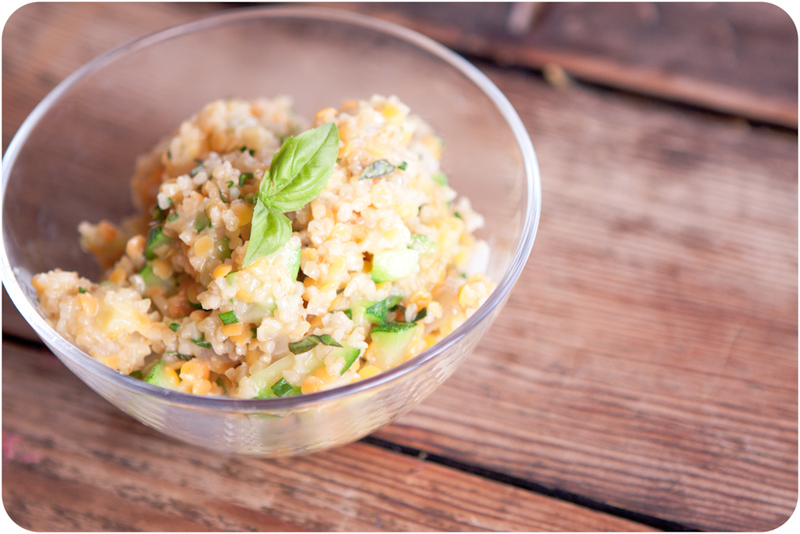 i need to buy some bulgur and give it a try! thanks for the idea!